I have been using eLearning development authoring tools to create self-paced / interactive eLearning material. Recently, I have learned the new technique to create learning material called whiteboard animation, which may be helpful for Instructional Designers or Content Developers to create more engaging learning material for the learners. When Instructional Designers choose methods for eLearning based on the analysis, this option also can play a great role for training delivery. Whiteboard animation is a process where a creative story and a storyboard with pictures are drawn on a whiteboard by artists who record themselves during the process of their artwork. This is a wiki definition, but in simple language it is just a translation of your thoughts; storyboard into animated sequential way to engage the learners. This concept can also be used in Sales and Marketing, Create Branding, Customer Awareness, Product Awareness, Fun Stories etc. We used to learn by a whiteboard when we were studying, and we have seen that this is the most common method nowadays as well. When using this concept more digitally, we can create much more engaging learning material. This can become the great pillar of today's education system. This is the MOOCs world, where we can learn everything online and get the course on mobile devices and tablets as well. Many learners benefit by this kind of online based learning. However, there are still interactions with SMEs that are required to get learners engaged with the course and the resolution of the queries. This may be replaced with whiteboard based animation with little effort, while we can also create interactivity within the whiteboard animation. VideoScribe empowers you to create your own whiteboard-style animated videos without any design or technical know-how. GoAnimate allows you to produce your own professional whiteboard animation-style video using your mouse and your favorite internet browser on GoAnimate! PowToon is another great web tool that enables you to create powerful video animations and presentations. Although this is one way of animation which the learner can see and hear, it can be made interactive using authoring tools where the learner can interact with the animation and perform actions based on adult learning principles. Top eLearning authoring tools have the feature to work with videos and create and merge those videos with the eLearning course. Whiteboard animation software generates the video output files while it can also be used to recreate with authoring tools with proper interactivity and animations. Tools like Adobe Captivate and Articulate Storyline have the features to import video into the eLearning courses, where the whiteboard animation can be easily merged with eLearning courses. Most of the whiteboard animations are pictorial representations where a voice-over is a very useful medium to embed with animations to create effective learning material. However, when you are using your text based whiteboard animation, it may not be required to use voice-overs. Instead, you can use background music for creating soothing learning experiences. 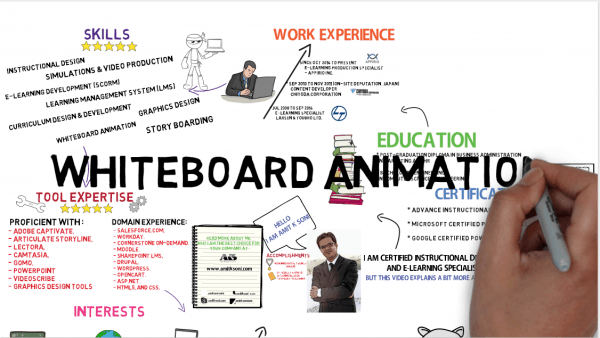 Recently I have created my whiteboard animation to showcase my resume and career background. Here I have tried to use the text-based information rather pictorially. Whiteboard animations are fun and also can create an effective learning experience for learners. Creating this kind of learning material can be used to create an online digital classroom where learners can directly learn the topic without the help of teachers. In this digital world, where now everything is translated into digital mode, whiteboard animations may become an effective mode digital medium for the near future.